A WSJ chart caught my eye the other day – I spotted someone looking at it in a coffee shop, and immediately got a hold of a copy. The chart plots the ebb and flow of GE’s revenues from the 1980s to the present. What grabbed my attention? The less-used chart form, and the appealing but not too gaudy color scheme. The chart presents a highly digestible view of the structure of GE’s revenues. We learn about GE’s major divisions, as well as how certain segments split from or merged with others over time. Major acquisitions and divestitures are also depicted; if these events are the main focus, the designer should find ways to make these moments stand out more. An interesting design decision concerns the sequence of the divisions. One possible order is by increasing or decreasing importance, typically indicated by proportional revenues. This is complicated by the changing nature of the business over the decades. So financial services went from nothing to the largest division by far to almost disappearing. The sequencing need not be data-driven; it can be design-constrained. The merging and splitting of business units are conveyed via linking arrows. Longer arrows are unsightly, and meshes of arrows are confusing. On this chart, the long arrow pointing from the orange to the gray around 2004 feels out of place. What if the financial services block is moved to the right of the consumer block? That will significantly shorten the long arrow. It won’t create other entanglements as the media block is completely disjoint and there are no other arrows tying financial services to another division. To improve readability, the bars are spaced out horizontally. The addition of whitespace distorts the proportionality. So, in 2001, the annotation states that financial services (orange) accounted for “about half of the revenues,” which is directly contradicted by the visual perception – readers find the orange bar to be clearly shorter than the total length of the other bars. This is a serious deficiency of the chart form but this chart conveys the "ebb and flow" very well. Today's post deals with the following chart, which appeared recently at Business Insider (hat tip: my sister). It's immediately obvious that this chart requires a heroic effort to decipher. The question shown in the chart title "How many senior investment bankers left their firms?" is the easiest to answer, as the designer places the number of exits in the central circle of each plot relating to a top-tier investment bank (aka "featured bank"). Note that the visual design plays no role in delivering the message, as readers just scan the data from those circles. The entire post including an alternative view of the dataset is a guest blog at the JMP Blog here. This is a situation in which plotting everything will make an unreadable chart, and the designer has to think hard about what s/he is really trying to accomplish. The following Made in France poster brings out all the stereotypes of the French. It's a sankey diagram with so many flows that it screams "it's complicated!" This is an example of a graphic for want of a story. In a Trifecta Checkup, it's failing in the Q(uestion) corner. It's also failing in the D(ata) corner. Take a look at the top of the chart. Wine exports totaled $9 billion which is about 1.6% of total exports. That's the largest category of the eight shown on the page. Clearly the vast majority of exports are excluded from the sankey diagram. Are the 8 the largest categories of exports for France? According to this site, those are (1) machinery (2) aircraft (3) vehicles (4) electrical machinery (5) pharmaceuticals (6) plastics (7) beverages, spirits, vinegar (8) perfumes, cosmetics. Compare: (1) wines (2) jewellery (3) perfume (4) clothing (5) cheese (6) baked goods (7) chocolate (8) paintings. It's stereotype central. Name 8 things associated with the French brand and cherry-pick those. The problem with interpreting this list of countries is best felt by attempting to describe which countries ended up on this list! It's the list of countries that belong to the top 10 importers of one or more of the eight chosen products, ordered by the total value of imports in those 8 categories only but only including the value in any category if it rises to the top 10 of the respective category. In short, with all those qualifications, the size or rank of the black bars does not convey any useful information. One feature of the chart that surprised me was no flows in the Wine category from France to Italy or Spain. (Based on the above discussion, you should realize that no flows does not mean no exports.) So I went to the Comtrade database that is referenced in the poster, and pulled out all the wine export data. On the right half, the countries in the blue zone accounted for three-fifths with the unspecified countries taking two-fifths. As indicated, the two-fifths (in gray) represent 20% of total wine exports, and were spread out among over 180 countries. The most time-consuming part of this exercise was finding the appropriate structure which can be easily explained in a visual manner. Long-time reader Daniel L. sends in this chart illustrating a large data set of intra-state migration flows in the U.S. The original chart is at Vizynary by way of Daily Kos. This is a great way, perhaps the only way, to consume the chart. Essentially, the reader is asked to generate a small-multiples panel of charts. The chart does a better job at showing the pairs of states between which people migrate than at showing the relative size of the flows. The size of the flows is coded in the width of the arcs. The widths are too similar to tell apart; and it doesn't help that no legend is provided. The choice of color is curious. Each region of the country is its own color, in a "nominal" way. It is a design decision to emphasize regions. Another decision is to hide information on the distances of the migrations. Evidently, the designer sacrificed that information in order to create the neat circular arrangement of states. A shortcoming of this representation is one missing dimension: the direction of the flow. I'm not sure given any pair of states A and B, whether the net migration is into A or into B.
I propose a solution using the map while preserving the interactive element of the original. On this map, when you hover over a particular state, it highlights all other states for which there are migrations flows into or out of that state. For color, use a blue-white-red scheme with blue indicating net inflow, red indicating net outflow, and white for near-zero flows. Include a legend. Another important decision for the designer is absolute versus relative scales. In an absolute scheme, you rank the entire set of flows for all pairs of states; obviously, the resulting colors would be influenced by the state populations. Alternatively, you rank the flow sizes within each state; in this case, the smaller states will feel exaggerated. The map has the additional advantage of showing the approximate distance (and direction) moved, which, for me, is a useful piece of information. New but is it better? In the Euro 2012 that's happening right now, the group stage is followed by the knockout stage (quarter-, semi- and final). The knockout stage is pretty straightforward. The group stage presents some challenges because it's difficult to present the chronology together with the team standing at the same time. I have mixed feelings about this presentation. It's easier to get a sense of how each team performed chronologically over the course of the competition. But then, I can't figure out what day the winner of a quarterfinal would play in the semifinal. Andrew Sullivan (link) re-printed this grouped column chart showing the result of a Washington Post-ABC poll on how voters say they would react to Ron Paul running as an independent candidate in next year's U.S. presidential election. One aspect of this chart bothers me... depending on one's familiarity with the election politics, the need to read carefully both the titles at the bottom of the chart, and the legend, and possibly also the title of the chart (or the knowledge that the Republican wears red and Democrat blue) in order to orient onself. You can experiment by blocking out one or two of these three items. Here's the same chart with a small number of fixes. Printing the legend onto the bars themselves makes the data more readable. This change necessitates flipping the columns over to horizontal bars. There are pros and cons to using a stacked chart versus a grouped chart. Neither of these charts answer the burning question in the reader's mind, which is likely to be from whom would Paul take his votes. The key message from above is that the insertion of Paul is projected to make the identity of the Republican candidate irrelevant. The following flow chart emphasizes the shift in votes as opposed to the vote totals. It appears that the Others/Undecided voters who can still swing the election do not consider Ron Paul as a desirable alternative. Most of Ron Paul's supporters would come from voters who would have cast their votes for the Republican or Democratic candidate (by a ratio of 3 Republican votes to 1 Democratic vote if Romney is running, or 3 to 2 if Gingrich is running). Felix Salmon (link) and others linked to this BBC News graphic about European debt recently. At first sight, the use of arrows inside a ring, enhanced by an interactive filter by country, seems to be an inspired idea. Then, I started clicking. Here is the German view. According to the paragraph beneath the headline, the arrows show how much money is owed by each country to banks in other nations. So, it appears that German banks have lentborrowed about equal amounts tofrom France and Italy, and also good amounts tofrom the U.S., the U.K. and Japan. And German banks would be affected if these debtors were to default. Now, take a look at the right column where BBC tells us "The biggest European economy is exposed to Greek, Irish and Portuguese, but mostly, Spanish debt." Say what? Much more important than appearance, the designer must ensure that the data and conclusions make sense. Here, the chart doesn't support the discussion. See also my previous post about Europe debt. Nick has done wonderful work on the evolution of the rail industry in the U.S., with a flow chart showing how mergers have produced the four giants of today, as well as a small multiples of maps showing how they split up the country. A lovely feature of the flow chart is the use of red lines to let readers see at a glance that Union Pacific is the only rail company that has lasted the entire 4 decades, while the other 3 giants came into being within the last 20 years. On the maps, notice a slight inconsistency between the left and right columns: on the right side, both maps have the same set of anchor cities, which act as "axes" to help readers compare the maps; on the left side, the sets of anchor cities are not identical. It would also be interested to see a version with all four route maps superimposed and differentiated by color. That may bring out the competitive structure better. 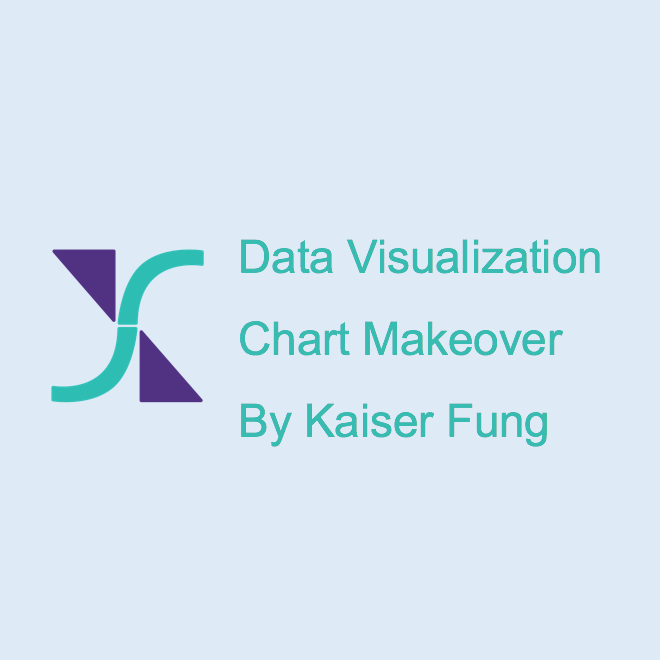 Georgette has a nice post summarizing issues with picking colors when producing charts. Her blog is called Moved by Metrics. Meanwhile, Martin finds a shockingly poor pie chart here. There was a time where you'd find the kind of heatmaps featured here by Nathan as wallpaper in my office. It's a great visualization tool for exploring temporal patterns in large data sets. However, I'd never even think of putting these in a presentation. It's a starting point, not an end-point, of an analysis project. Some things are wonderful for consumption only in private! This chart type is very popular, both among business consultants and statisticians. Consultants call them "marimekko charts" while statisticians call them "mosaic charts". It's got multiple names as it has been reinvented multiple times. I have nightmares from having to produce this sort of charts in Powerpoint by hand (deconstructing and reconstructing column charts), and I have written before about my dislike of them (see here, and here). Equality: it puts the two dimensions of the market place -- operating system/software, and producer/brand -- on equal footing. As an added bonus, the areas of the rectangles are meaningful: they correspond to the relative market shares. Structure: the chart often reveals interesting aspects of the structure of the data. For instance, here it shows that certain smartphones have "closed" systems where the OS and producer forms a one-to-one relationship while some producers like HTC makes phones with different operating systems. A little thought exposes these as false promises. The two dimensions are, in fact, not equal. Look at the one contiguous column for Apple versus two separate sections for HTC. In order to know the market share of HTC, the reader needs to do additions... in his/her head. While this is not so hard when HTC appears only twice, your reader would not be amused if HTC appears seven times on the same mosaic. It is a limitation of this chart type that one cannot get the column sections to be of one piece without destroying the one-piece structure of the row sections. In addition, I don't think it is easy to compare the areas of fat rectangles versus narrow rectangles, or squares versus long strips, etc. On consulting style charts, you almost always find the entire data set printed, which is to say, this chart is rendered not self-sufficient. On statistical charts, you typically find axis labels; this is not much better because of the difficulty in estimating relative areas. The extent to which one can learn the structure of the data is restricted by our ability to estimate and sum areas. In the junkart version, I use a flow chart. Special attention is paid to expressing as clearly as possible the structure of the marketplace, thus the separate sections for the "open" versus "closed" systems, as well as the many-to-many relationships among the "open"-system players. The thickness of the flows is proportional to the market shares. I added a few data points to anchor the scale. The two dimensions of the data are treated symmetrically. There is also no need to startle readers with a kaleidoscope of colors so typical of marimekkos. Long-time reader Nick B. found this attractive flow chart. The chart was produced by the Internet Monk blog. The data was culled from this report (PDF) by the Pew Forum. The cross-hairs trumpet excitement but the reader is left without much. One could tell that the unaffiliated proportion (red) has more than doubled, mostly at the expense of Catholics (green); that most religions retain the vast majority of their faithful (at least by internal proportions); and that people of one or another faith move to one or another faith. Yet, any of these high-level insights do not require a chart that contains data on movement between each pair of religions. One smart thing about this chart is the inclusion of "unaffiliated / no religion", which completes the picture; otherwise, some previously faithful people would drop off the chart (literally). The other smart thing is its self-sufficiency: none of the data is printed on the chart, and I doubt readers miss them. Here, I attempt an alternative, which is a variant of the Web of Debt chart discussed here. If the line thickness is made proportional to the percentages, that would eliminate the need to have all those numbers on the chart.